Aside from being the precursors of the Ab-secreting cells, B cells are engaged in other immune functions such as Ag presentation to T cells or cytokine production. These functions may contribute to the pathogenic role of B cells in a wide range of autoimmune diseases. We demonstrate that B cells acquire the capacity to amplify IFN-γ production by CD4 and CD8 T cells during the course of the Th1 inflammatory response to Toxoplasma gondii infection. Using the two following different strategies, we observed that B cells from T. gondii-infected mice, but not from naive mice, induce higher IFN-γ expression by splenic host T cells: 1) reconstitution of B cell-deficient mice with B cells expressing an alloantigen different from the recipients, and 2) adoptive transfer of B and T cells into RAG−/− mice. In vitro assays allowing the physical separation of T and B cells demonstrate that Ag-primed B cells enhance IFN-γ production by T cells in a contact-dependent fashion. Using an OVA-transgenic strain of T. gondii and OVA-specific CD4 T cells, we observed that the proinflammatory effect of B cells is neither Ag specific nor requires MHCII expression. However, TNF-α expressed on the surface of B cells appears to mediate in part the up-regulation of IFN-γ by the effector T cells. It is well appreciated that B lymphocytes have the potential to act as APC as well as precursor cells for the humoral immune response. B1 and marginal zone B cells are specialized to respond to thymus-independent Ags that suggest the existence of natural innate B cell response. In contrast, B cell responses to most protein Ags require the activation of dendritic cells and the recruitment of Ag-specific Th cells. Regarding these thymus-dependent responses, which mainly involve follicular B2 cells (1), naive B cells internalize through their surface Igs (IgM and IgD), process, and present specific Ags via MHC class II molecules to CD4 T cells. Following interaction with T cells, B cells either differentiate into IgM-producing short-lived plasma cells or undergo hypersomatic mutations and class switch recombination within the germinal centers, thereby producing long-lived plasma cells and memory B cells (2). In addition, B cells might be capable of cross-priming with CD8+ T cells (3, 4). Polyclonal activation by TLR signaling can also occur, in particular for B1, marginal zone, and memory B cells. In B2 cells, unless the stimulation of the TLR is coupled to the engagement of the BCR, this type of activation aborts (5). B cells, when stimulated, produce a wide range of polarizing cytokines such as IL-12 and IFN-γ (6), or IL-4 (7). The so-designated B effector 1 and B effector 2 cells, respectively, produce polarized subsets of cytokines following infection with Th1- and Th2-inducing pathogen (8). IFN-γ-producing B cells have been identified in mice infected with pathogens such as Toxoplasma gondii and Borrelia burgdorferi (8). The role of B cells in some autoimmune disorders such as systemic lupus erythematosus or rheumatoid arthritis (RA)3 may in part be due to the production of autoantibodies whose binding to tissues leads to damages by induction of local inflammatory response. Alternatively, the ability of B cells to promote T cell activation by Ag presentation, costimulation, or cytokine production has also been suggested as part of the pathogenic process (9). In humans, mounting evidence based on the results of clinical trials with the B cell-depleting Ab anti-CD20 (rituximab) for some autoimmune diseases including RA and multiple sclerosis would suggest that B cells play a vital role in the amplification of the effector T cell response associated with disease progression (10, 11, 12). Infection with the obligate intracellular protozoan T. gondii induces a Th1 inflammatory response (13, 14). C57BL/6 mice succumb within 10 days postoral infection from an overwhelming Th1 inflammation affecting the ileum and characterized by the overproduction of IFN-γ and TNF-α by T cells (15). We use this strong inducer of a Th1 response to demonstrate that B cells, when activated, enhance CD4+ and CD8+ T cell responses. This activation occurs within 7 days after infection, and the proinflammatory effect of D7-primed B cells requires T cell contact, but is not Ag specific. The mechanisms involved may be linked to the presence of membrane-bound TNF-α on B cell surface. Female 8- to 10-wk-old C57BL/6 (B6), μMT (B cell-deficient mice on a B6 background), CCL3−/− and TNF-α−/− mice (B6 background), and RAG1−/− (B and T cell-deficient mice on a B6 background) mice were obtained from The Jackson Laboratory. MHCII−/− (B6 background) mice were purchased at Taconic Farms. B6-Ly5.2 (B6 mice expressing the alloantigen CD45.1) and OTII mice (B6 mice whose CD4 T cells express an OVA-specific TCR) were given by R. Noelle (Dartmouth Medical School, Lebanon, NH). These mice were housed under approved conditions at the Animal Research Facility of Dartmouth Medical School. Mice were infected orally by intragastric gavage with 35 cysts of T. gondii. Unless specified otherwise, the 76K strain of T. gondii was used. Parasites secreting OVA in the parasitic vacuole (P30-OVA) (16) or wild-type (WT) parental controls, both on a Prugniaud background, were provided by D. Roos and F. Dzierszinski (University of Pennsylvania, Philadelphia, PA). Parasites were maintained through passage in CBA/J mice. To measure T. gondii parasite burden, the T. gondii B1 gene was amplified by real-time PCR using the 2× SYBR Green mix (Applied Biosystems) on a Bio-Rad iCycler, from ∼500 ng of total genomic DNA prepared using the DNeasy kit (Qiagen). A standard curve for parasite equivalents was generated by real-time PCR using a plasmid, as previously described, as follows: QB1 forward, GGAACTGCATCCGTTCATGAG, and reverse, TCTTTAAAGCGTTCGTGGTC. For each sample, the parasite count was calculated by interpolation from the standard curve (17, 18). The parasite numbers were normalized to the exact amount of DNA using primers targeting the β-actin gene (19), as follows: forward, AGCCATGTACGTAGCCATCC; reverse, CTCTCAGCTGTGGTGGTGAA. Mesenteric lymph nodes (MLN), Peyer’s patches, and spleen were dissociated and freed of connective tissue by filtration (70-μm cell strainers). Transfer of B cells into μMT. Cells were collected from the MLN and spleen from naive or 7 days previously infected (D7-infected) B6, B6-Ly5.2, MHCII−/−, TNF-α−/−, or CCL3−/− mice and were selected with anti-CD19 magnetic beads (Miltenyi Biotec). CD19+ cells from MLN and spleen were mixed (10% of the final mix came from MLN CD19+ cells, and 90% came from CD19+ splenic cells). Purity was checked before each transfer by staining with anti-CD19 allophycocyanin, and 107 cells/recipient were injected i.v. in the retro-orbital sinus of μMT mice. Only the pan B cell marker CD19 was used for sorting, whereas CD19 or B220 was used as B cell marker for surface staining. Three to six mice per group were adoptively transferred with B cells isolated from three to four mice. CD4+CD45RBhighCD25− T effector cells were sorted from the MLN of eight D5-infected B6 mice by FACS after staining with anti-mouse CD4 FITC, CD45RB PE, and CD25 PerCP (BD Pharmingen). CD8α+CD5+ T cells were sorted from the MLN of four D5-infected B6 mice by FACS following staining with anti-mouse CD8α PE and CD5 allophycocyanin (BD Pharmingen). A purity >99% was obtained for the sort of both T cell types. CD19+ B cells from MLN and spleen of at least two naive (D0B) or D7-infected (D7B) B6 mice were magnetically sorted (as described above). Different combinations of these lymphocyte types (105 T cells/recipient, 106 B cells/recipient) were injected i.v. into RAG1−/− mice (four mice per group). Transferred RAG1−/− mice were infected the following day with 35 cysts, and cells from MLN and spleen were analyzed 10 days after infection. CD4+ cells from the spleen and MLN of two OTII mice were purified by magnetic sorting with a CD4+ T cell isolation kit (Miltenyi Biotec). They were CFSE labeled and injected i.v. into MHCII−/− mice (106 cells/recipient). B cells were sorted with anti-CD19 magnetic beads (Miltenyi Biotec) from the spleen and MLN of two naive mice (D0B) or two mice infected with 35 cysts of P30-OVA or WT parasites (Prugniaud background) at D7 and injected i.v. into MHCII−/− mice (107 cells/recipient; three to four recipients per group) the day after OTII transfer. Three days later, the IFN-γ production by splenic CFSE+ T cells was measured by intracellular cytokine staining. Cells were incubated 2 h in 50 ng/ml PMA (Sigma-Aldrich) and 500 ng/ml ionomycin (Sigma-Aldrich). Then 10 μg/ml brefeldin A (Sigma-Aldrich) was added for 1 h. FcRs of cells were blocked with anti-CD16/CD32 Ab (BD Pharmingen) before surface staining in HBSS/5% FBS with B220 PerCP or CD4 FITC and CD8α PerCP or CD5 PerCP, or CD4 PerCP or CD8α PerCP and CD45.2 FITC (BD Pharmingen). Cells were permeabilized with BD Cytofix/Cytoperm (BD Pharmingen). Nonspecific sites were blocked with heat-inactivated rat serum (Harlan Sprague-Dawley), and intracellular IFN-γ and TNF-α were stained with anti-mouse IFN-γ allophycocyanin and TNF-α PE, respectively (BD Pharmingen). A total of 107 cells/ml was resuspended in RPMI 1640 containing 5 μM CFSE (Invitrogen Life Technologies) and incubated 10 min in dark at 37°C. After incubation, the equal volume of FBS was added and tubes were topped with RPMI 1640. Cells were then immediately washed twice with RPMI 1640-5% FBS. Coculture of T and B cells. T and B cells were purified from the spleen and MLN of naive (three mice) or D5 (two mice)- or D7 (three mice)-infected B6 mice with anti-CD90 and anti-CD19 magnetic beads (Miltenyi Biotec), respectively. T cells were CFSE labeled. Lower chambers of a HTS Transwell-96 system 0.4 μm pore size (Corning Glass) were seeded in triplicates with 0.5 × 106 T cells, alone (D0T or D5T) or with 106 D0 B cells (D0T + D0B or D5T + D0B) or 106 D7B cells (D0T + D7B or D5T + D7B), either in the lower chamber or in the upper chamber. Cells were cultured in RPMI 1640 with l-glutamine added with 10% FBS (Atlanta), penicillin (100 U/ml; Invitrogen Life Technologies), streptomycin (100 U/ml; Invitrogen Life Technologies), and 2-ME (55 μM; Invitrogen Life Technologies) 3 days at 37°C, and then washed and prepared for intracellular staining, as described earlier. Cytokine production by B cells. Splenic B cells were sorted from three naive (D0) or infected B6 mice at different time points (D2, D4, D7) with anti-CD19 magnetic beads (Milenyi Biotec) (purity >97%) and cultured 24 h in RPMI 1640–10% FBS (2 × 105 cells/well). Cytokine concentration in the culture supernatant was then measured with a multicytokine kit for CCL3, TNF-α, and IFN-γ (BioSource International). Results are expressed as the mean ± SEM. Statistical differences between groups were analyzed using Prism Statistical Software’s unpaired t test; significance was expressed as p < 0.05 (∗), p < 0.01 (∗∗), or p < 0.001 (∗∗∗). Oral infection with T. gondii and the subsequent development of inflammation in B6 mice are correlated with an overproduction of Th1-like cytokine such as IFN-γ by T cells (15). In the spleen, which is an organ in which B cells are dominant, the induction of IFN-γ production by splenic CD4+ T cells from μMT mice was impaired at day 7 postinfection as compared with WT B6 mice (Fig. 1⇓). However, the splenic parasite burden was similar in WT B6 mice and in μMT mice, as measured by real-time PCR (data not shown). B cell-deficient mice have a depressed CD4 T cell response in the spleen following challenge with T. gondii. IFN-γ production by CD4 or CD8+ cells in the spleen at D7. IFN-γ was detected by intracellular staining, and the percentage of IFN-γ-positive cells in CD4+ or CD8+ gate was measured by FACS. The means of the percentages of IFN-γ+ cells in CD4+ or CD8+ gates for seven experiments with at least three mice per group are represented as a bar graph; error bars are SEM. ∗∗, p < 0.01. B cell-deficient mice are known to have defects in lymphoid organ architecture (20). The reduced induction of IFN-γ production by splenic T cells from infected μMT mice could be attributed to impairment of Ag presentation and T cell priming. To address this issue, μMT and RAG1−/− mice were reconstituted with B cells, and B and T cells, respectively. The lack of T cell activation in infected μMT mice was first studied by reconstitution of μMT mice with B cells from a mix of MLN and splenic cells (respectively 10 and 90%) isolated from either naive (D0B) or D7-infected (D7B) mice (purity 97–99%; Fig. 2⇓A). The mice were infected 1 day post-B cell transfer. Seven days after infection, D0B and D7B cells were found mainly in the spleen as follows: 1.2 and 1.3% of B220+ B cells in infected μMT + D0B and μMT + D7B mice, respectively, and 0.3% in infected and nonreconstituted μMT mice (data not shown). Transfer of D7B cells led to a large increase in IFN-γ production by splenic CD4 and CD8 T cells from infected recipient mice (Fig. 2⇓, B and C). In contrast, adoptive transfer of D0B cells induced only a slight increase in IFN-γ expression by splenic CD4 and CD8 T cells from D7-infected recipients as compared with mice that did not receive any B cell (Fig. 2⇓, B and C). Despite the purification procedure applied to the B cell population (up to 99%), a small contamination of the adoptively transferred D7B cell by Ag-experienced T cells might account for the increase in the IFN-γ+ T cell population. To rule out this possibility, D7B cells from B6-Ly5.2 mice expressing the CD45.1 alloantigen, which is different from the alloantigen expressed by B6 and μMT mice (CD45.2), were adoptively transferred into μMT mice, as well as D7B cells from B6 mice as a positive control, and IFN-γ expression by CD4+ or CD8+CD45.2+ T cells (from the recipient) was assessed. Transfer of D7B cells from both CD45.2-expressing and CD45.1-expressing mice led to an increase in the frequency of CD45.2+CD4+ IFN-γ+ and CD45.2+CD8+ IFN-γ+ T cells, without any significant difference (Fig. 2⇓, D and E). In case of adoptive transfer with CD45.1+ D7B cells, CD45.1+ T cells were not detected in host (all T cells were CD45.2+; data not shown). This observation suggests that D7B cells (CD45.1+) can activate splenic host T cells (CD45.2+) to produce IFN-γ. Increase in IFN-γ production by splenic T cells from B cell-deficient mice after transfer of D7-primed B cells. A, CD19+ B cells were sorted from MLN and spleen cells and combined in the respective proportions, as follows: 10 and 90%. An aliquot of each fraction was stained with anti-CD19 allophycocyanin and anti-CD5 PerCP (pan T cell marker). A purity of 97–99% was routinely obtained. Numbers are the percentage of CD19+ cells in the represented gate. B and C, CD19+ B cells were purified as in A, and 107 B cells/mouse were i.v. injected into B cell-deficient mice (μMT). One day after transfer, mice were challenged with 35 cysts of T. gondii and were sacrificed 7 days later for analysis. IFN-γ production by CD4 or CD8 T cells from the spleen of μMT mice, μMT mice transferred with D0 B cells (μMT + D0B), or μMT mice transferred with D7B cells (μMT + D7B) was measured by intracellular staining 7 days after infection. B, Representative FACS profile of six to seven experiments. Numbers are the percentage of positive cells in the represented gates. C, The fold increase in IFN-γ expression by T cells from the spleen of adoptively transferred hosts (μMT + D0B or μMT + D7B) relative to nontransferred μMT mice was calculated as follows for each experiment: (average of percents of IFN-γ+ cells in CD4 or CD8+ gates for transferred groups)/(average of percents of IFN-γ+ cells in CD4 or CD8+ gates for μMT). The average of these fold increases for six (μMT + D0B) or seven (μMT + D7B) experiments with at least three mice per group is represented. Error bars: SEM, p values: fold increase for μMT + D7B vs fold increase for μMT + D0B. ∗, p < 0.05; ∗∗, p < 0.01; ∗∗∗, p < 0.001. D and E, D7B cells amplify IFN-γ response of splenic host T cells. CD19+ B cells from a mix of CD19+ MLN and splenic cells (respectively 10 and 90%) from four CD45.1+ mice (CD45.1+D7B) or three WT B6 mice (CD45.2+D7B) 7 days after infection. A total of 107 B cells/mouse was i.v. injected into B cell-deficient mice (μMT). One day after transfer, mice were challenged with 35 cysts of T. gondii and were sacrificed 7 days later for analysis. IFN-γ production by CD4+ or CD8+ T cells from the spleen of WT B6 mice, μMT mice, μMT mice transferred with CD45.1+ D7B cells (μMT + CD45.1+D7B), or μMT mice transferred with CD45.2+ D7B cells (μMT + CD45.2+D7B) was measured by intracellular staining 7 days after infection. D, Representative FACS profiles of IFN-γ and CD4 or CD8 expression in CD45.2+ gates; numbers are percentages of cells in each quadrant. E, Average of percentages of IFN-γ+ cells in CD4+ or CD8+ gates (after gating on CD45.2+ cells) for three groups of two mice, measured by flow cytometry. Error bars are SEM. Previous studies from our laboratory have demonstrated that at day 5 following oral infection with T. gondii, CD4+CD45RBhighCD25− T cells can induce ileitis in RAG−/− mice following adoptive transfer and Ag re-exposure (21). For these studies, T. gondii-primed effector CD4+CD45RBhighCD25− T cells from D5-infected mice alone or with either D0B or D7B cells were adoptively transferred into RAG1−/− mice (B6 background) lacking mature B and T cells. RAG1−/− mice were infected the day after reconstitution, and analyzed 9–10 days later for evidence of ileitis. After infection, unlike the nontransferred RAG1−/−, all groups receiving these primed effector T cells developed the intestinal disease, confirming the efficacy of the transfer. Higher IFN-γ production by splenic CD4+ T cells was observed via FACS analysis when effector T cells were cotransferred with D7B cells (6.88% of CD4+IFN-γ+ cells) than with D0B cells (2.71%) or without B cells (0.13%) (Fig. 3⇓A). However, transfer of D7B cells alone did not lead to the development of such a CD4+ T cell population (Fig. 3⇓, group RAG1−/− + D7B). The IFN-γ+ CD4+ T cells observed in the spleen of RAG1−/− mice after cotransfer of effector T cells and D7B are thus probably not issued from a contamination of the D7B cells by Ag-experienced T cells, confirming the data obtained with the use of mice expressing the different alloantigens CD45.1 and CD45.2. We observed an increased IFN-γ response by splenic CD8+ T cells following transfer of D7B cells into μMT mice 7 days after T. gondii infection (Fig. 2⇑). To determine whether B cells directly enhance CD8 T cell activation, D7B cells, or D0B cells as a control, were cotransferred with CD8 T cells from D5-infected B6 mice into RAG1−/− mice and infected the following day. Nine-10 days posttransfer, CD8 T cells were analyzed for expression of IFN-γ. Cotransfer of CD8 T cells with D7B cells, but not with D0B cells, resulted in enhanced IFN-γ production (Fig. 3⇓B). These findings suggest that, upon activation, B cells acquire the capacity to enhance IFN-γ production by both CD4 and CD8 T cells. Activation of T cells by D7-primed B cells. CD4+CD25−CD45RBhigh (A) or CD8α+CD5+ (B) T cells were sorted by FACS from MLN of D5-infected B6 mice (purity >99% for both cases). B cells from a mix of CD19+ MLN and splenic cells (respectively 10 and 90%) from naive (D0B) or D7-infected (D7B) B6 mice were magnetically sorted with anti-CD19 beads (purity >97%). 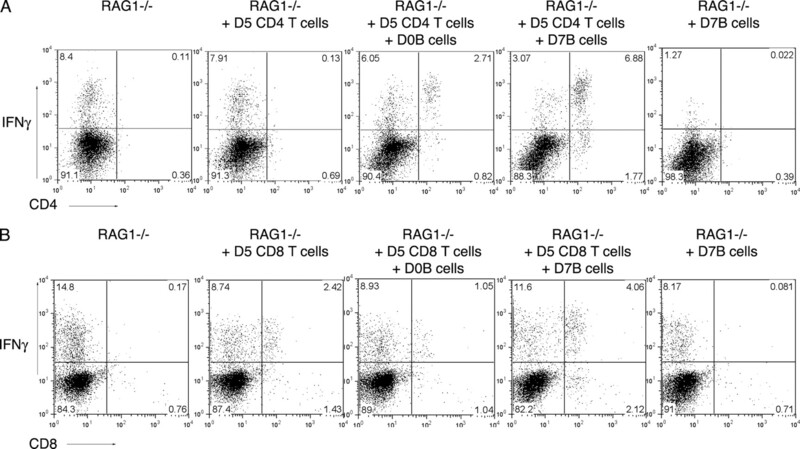 T cells alone or D7B cells alone or mix of T cells and D0B or T cells and D7B were injected (105 T cells, 106 B cells) into RAG1−/− mice (B6 background) that lack mature B and T cells. Mice were challenged with 35 cysts of T. gondii the day following transfer and sacrificed 9–10 days later when the disease had obviously set up. A total of 106 splenic cells was stained, and CD4+ T or CD8+ T cells were analyzed for IFN-γ production by intracellular staining. Numbers are the percentages of positive cells in the represented gates. These results are representative of two independent experiments, using three mice per group. 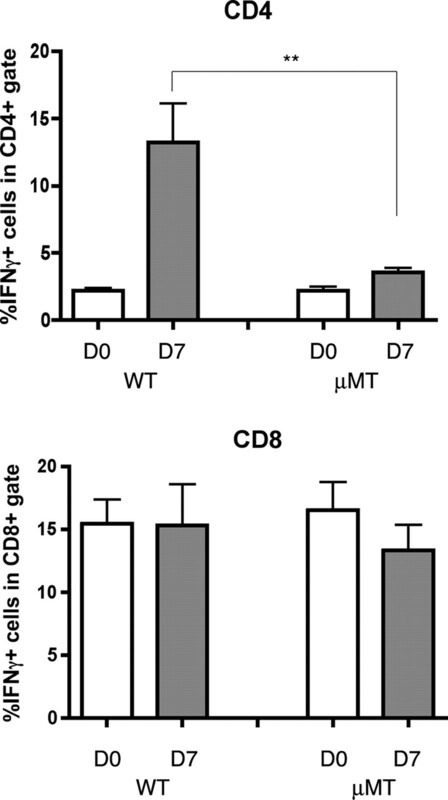 The observation that adoptively transferred D7B cells into μMT mice enhanced IFN-γ-producing CD4+ and CD8+ T cells suggests a direct effect of D7B cells on T cell responses. To test whether the D7B cells activate T cells via cell-cell contact, an experiment using a HTS Transwell-96 system, in which a semipermeable membrane prevents cell-cell contact, but not circulation of cytokines or chemokines, was performed. CFSE-labeled CD90+ T cells from naive and D5-infected mice (D0T or D5T) T cells were seeded in the lower chamber of a Transwell system, and CD19+ B cells from naive and D7-infected mice (D0B or D7B) were added to either the lower chamber, allowing contact with T cells, or in the upper chamber, without direct contact with T cells. After 3 days of culture and in the absence of any stimulation, the frequency of IFN-γ+ D0T and D5T cells was low, the former being only slightly higher than the latter. However, coculture of D7B cells in direct contact with both D0T or D5T cells significantly increased the production of IFN-γ by D0 and D5 CD4+ T cells (respectively p < 0.001 and p < 0.01) and D0 CD8+ T cells (p < 0.05), which illustrates the direct proinflammatory effect of D7B cells on IFN-γ production by T cells (Fig. 4⇓). 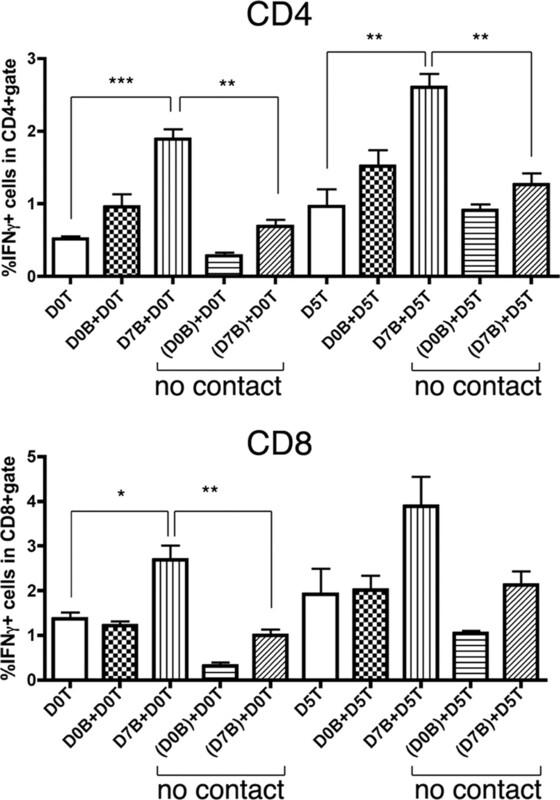 IFN-γ production by D5 CD8 T cells was also augmented by direct contact with D7B cells, although not significantly. In contrast, when D7B cells were separated from the T cells by the HTS Transwell-96 system, T cells failed to demonstrate an increase in IFN-γ production, suggesting that the proinflammatory effect of D7B cells requires direct cell-cell contact with the T cells (Fig. 4⇓). There was no difference in CFSE-dye dilution when T cells were cultured alone or with B cells, which means that B cells did not affect T cell proliferation in this system (data not shown). The proinflammatory effect of D7B cells is direct and contact dependent. T and B cells were sorted with magnetic beads (anti-CD90 and anti-CD19, respectively; purity 98% minimum) from MLN and spleen of naive or D7-infected B6 mice. A total of 0.5 × 106 naive (D0) or 0.5 × 106 primed (D5) T cells was CFSE labeled and seeded in the lower chamber of a HTS Transwell-96 0.4-μm pore-size system. A total of 106 D0B or 106 D7B cells was added in the same chamber as T cells, or in the upper chamber of the HTS Transwell-96 system (D0B or D7B represented between parentheses in the legend). After 3 days of culture, the cells were briefly restimulated with PMA-ionomycin for staining of intracellular IFN-γ and CD4 or CD8 surface markers. Error bars are SEM (n = 3); ∗, p < 0.05; ∗∗, p < 0.01; ∗∗∗, p < 0.001. These experiments were performed three times with consistent results. Once activated, B cells may become professional APC and consequently participate in the activation of T cells via Ag presentation on MHCII molecule. To test whether D7B cells can enhance IFN-γ production by T cells during Ag presentation, the requirement for Ag specificity was analyzed. 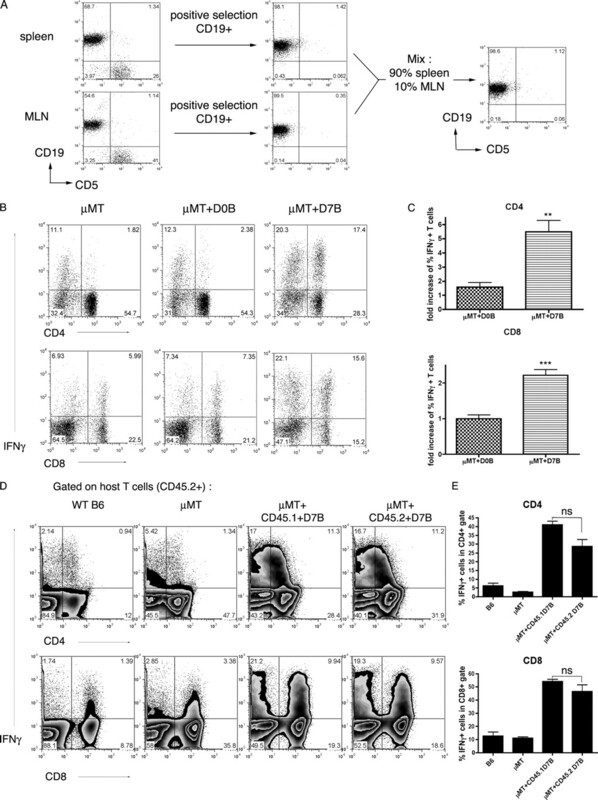 A total of 106 CD4+ T cells carrying a TCR specific for OVA (OTII cells) was CFSE labeled and adoptively transferred into MHCII−/− mice, so that only the adoptively transferred B cells could activate CD4+ T cells via MHCII. Either D0B cells, or D7B cells from mice infected with cysts from an OVA-secreting strain of T. gondii (P30-OVA) or from the WT parental strain, were adoptively transferred the following day. Three days later, spleens from the recipient mice were collected and analyzed for IFN-γ secretion by CFSE+ T cells, which at this point include T cells that might have started to divide as well as nondivided cells. 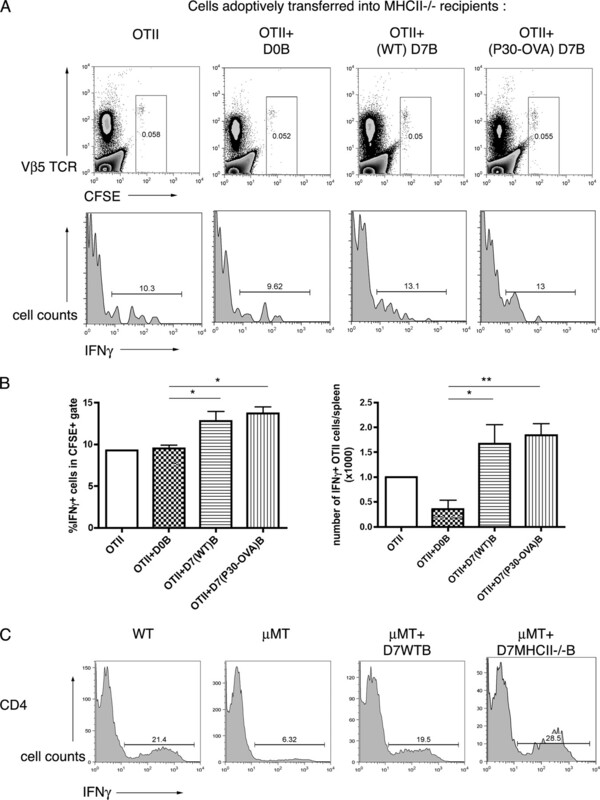 Adoptive transfer of P30-OVA-primed D7B cells (OTII+D7(P30-OVA)B) and of WT-primed D7B cells (OTII+D7(WT)B) significantly (p < 0.05) enhanced IFN-γ production by OTII cells in recipient mice (Fig. 5⇓, A and B), as measured by percentages of IFN-γ+ OTII cells or absolute numbers of IFN-γ+ OTII cells, indicating that activation was required, but not dependent upon Ag specificity. Ag presentation is not required for the proinflammatory effect of B cells. A and B, OTII cells (T cells expressing an OVA-specific TCR) were CFSE labeled and transferred into MHCII−/− mice (106 cells/recipients). The following day, naive B cells (D0B) or D7B cells (107 cells/recipients, purity >98%) primed in vivo with parasites secreting OVA in the parasitic vacuole (D7(P30-OVA)B) or with the WT parental strain (D7(WT)B) were injected into the recipients of OTII cells. Three days after B cell transfer, mice were sacrificed, spleens were collected, and the IFN-γ production by the CFSE+ T cells was measured. A, Top, FACS data representing the expression of Vβ5 chain (expressed by OTII cells in their transgenic TCR) and CFSE on total live splenic cells (2 × 105 cells were acquired for analysis). Numbers represent the percentage of CFSE+ cells. Bottom, IFN-γ expression of cells in CFSE+ gate as defined in top; numbers represent the percentage of IFN-γ+ cells. B, Histograms showing the average of the percentages of IFN-γ+ cells in CFSE+ gate measured for each sample of each group (n = 3) (left) or the absolute numbers of IFN-γ+ OTII cells/spleen (right). Error bar is SEM; ∗, p < 0.05; ∗∗, p < 0.01. C, D7B cells from a mix of splenic (90%) or MLN (10%) D7B cells of D7-infected WT or MHCII−/− mice were purified with anti-CD19 magnetic beads and injected into μMT mice (107 B cells/mouse, purity >99%). Recipients were infected the following day with 35 cysts and sacrificed at D7. IFN-γ production by splenic T cells was measured by intracellular cytokine staining for CD4+ cells. FACS profiles show the IFN-γ expression by cells in the CD4+ gate at D7, and numbers are the percentages of IFN-γ+ cells (as determined with isotype control) in these gates. These experiments have been repeated twice with consistent results, using three to four mice per group. WT, Nontransferred WT B6 mice; μMT, nontransferred μMT mice; μMT + D7WTB, μMT mice adoptively transferred with D7WT B; μMT + D7 MHCII−/− B, μMT mice adoptively transferred with D7 MHCII−/− B. One might argue that P30-OVA-primed B cell population did not contain any OVA-specific cells, even though P30-OVA parasites are known to induce an OVA-specific T cell response (16); thus, the enhancement of IFN-γ production by OTII cells observed could be influenced by the nominal presence of activated innate cells transferred with B cells. To rule out this possibility, an additional approach was developed. WT or MHCII−/− D7B cells were transferred into μMT recipients that were infected the following day, and IFN-γ production by T cells at D7 was measured. If Ag presentation by MHCII was involved in the proinflammatory effect of D7B cells, enhancement by D7B cells of IFN-γ production by CD4 T cells should be impaired by MHCII deficiency. IFN-γ+ CD4 T cells were actually in higher frequency when MHCII−/− D7B cells were transferred, as compared with mice transferred with WT D7B cells (Fig. 5⇑C). Taken together, these two different experiments further support the lack of involvement of Ag presentation in the proinflammatory role of D7B cells. A pathogenic role of B cells in autoimmune disease has been linked to an important role for the CD40/CD154 interactions in T cell activation (22). The involvement of the CD40/CD154 ligation was tested in vitro, by blockade of CD154 with the mAb MR1 during the coculture of sorted T and B cells. Disruption of the CD40/CD154 ligation did not prevent T cell activation in terms of IFN-γ production, by D7B cells, indicating that the direct interaction between the activated B and T cells was not dependent on costimulation via CD40/CD154 (data not shown). To characterize D7-primed B cells, B cell-mediated production of several cytokines and chemokines was tested using a multicytokine assay. B cells sorted from the spleen (purity >97%) of naive (D0) or D2- or D4- or D7-infected mice were cultured 24 h. TNF-α was not quantifiable in culture supernatant until D7 (Fig. 6⇓B). Consistent with these data, intracellular staining on B cells showed that the frequency of TNF-α+ B cells increased gradually after infection (Fig. 6⇓A). B cell-driven production of TNF-α at D7 plays a role in the proinflammatory effect of D7B cells. A, B cells from the spleen of D7-infected B6 mice were stained for B220, and their expression in TNF-α and IFN-γ was assessed by intracellular staining. The numbers are the percentage of positive cells for the indicated cytokine among the B220+ gated population. This experiment was repeated twice with consistent results, using four mice per group. B, Splenic B cells were positively selected for CD19 expression with anti-CD19 magnetic beads (purity >97%) at D0, D2, D4, and D7, and cultured 24 h (2 × 105 cells/well). TNF-α, IFN-γ, or CCL3 was detected by luminex assay of the culture supernatant. Error bar represents the SEM of the measure made in triplicates. ∗∗, p < 0.01 D7 vs D0. C, CD19+ B cells from a mix of CD19+ MLN and splenic cells (respectively 10 and 90%) purified with anti-CD19 magnetic beads from D7-infected WT, TNF-α−/−, and CCL3−/− mice. A total of 107 B cells was injected i.v. into μMT mice that were infected 1 day later. Seven days after infection, spleen cells were collected and stained for T cell surface markers (CD4, CD8) and intracellular IFN-γ. IFN-γ expression and percentages of IFN-γ+ cells in CD4+ (upper panel) and CD8+ (lower panel) gates are shown. Data are representative of two independent experiments with three mice per group. WT, Nontransferred WT B6 mice; μMT, nontransferred μMT mice; μMT + D7 WTB, μMT mice adoptively transferred with D7 WT B; μMT + D7 TNF-α−/− B, μMT mice adoptively transferred with D7 TNF-α−/− B; μMT + D7 CCL3−/− B, μMT mice adoptively transferred with D7 CCL3−/− B. To evaluate the importance of TNF-α in the proinflammatory role of D7B cells, D7B cells from TNF-α−/− mice were injected into μMT mice. Recipients were infected with T. gondii 1 day later, and IFN-γ production by host splenic T cells was assessed 7 days after infection. TNF-α−/− D7B cells were less efficient than WT D7B cells to amplify IFN-γ expression by T cells (Fig. 6⇑C), suggesting that TNF-α produced by B cells at D7 plays an important role in the proinflammatory effect of D7B cells. B cells produced little or no IL-12 at D7 (data not shown). Despite a low frequency of IFN-γ+ cells, D7B cells release large amounts of IFN-γ (Fig. 6⇑, A and B). However, in our model, IFN-γ−/− D7B cells retained the proinflammatory role of D7B cells when adoptively transferred into μMT mice (data not shown). CCL3 was also secreted in large quantities by B cells at D7 (Fig. 6⇑B). The importance of this chemokine in the proinflammatory role of D7B cells in vivo was evaluated. D7B cells deficient for CCL3 were injected into μMT mice, recipients were infected with T. gondii 1 day later, and IFN-γ production by host splenic T cells was assessed. Similar to TNF-α−/− D7B cells, CCL3−/− D7B cells induced a lower expansion of IFN-γ+ T cells than WT D7B (Fig. 6⇑C). TNF-α and CCL3 produced by B cells at D7 appear thus to participate in the proinflammatory effect of D7B cells. The role of B cells in T cell-mediated autoimmune diseases remains uncertain. In this study, we demonstrate that B cells amplify the splenic Th1-polarized response to T. gondii. T. gondii-infected B6 mice develop a robust and uncontrolled Th1 response. T. gondii-primed B cells, but not naive B cells, were able to increase IFN-γ production by splenic T cells in vivo. This proinflammatory property is developed post-B cell activation. The necessity for a direct contact interaction was demonstrated when naive and primed T cells cultured in vitro during 3 days with activated B cells showed an increased IFN-γ production, but not when these two populations were cultured across a transmembrane filter. B cells have the ability to present the Ag to CD4 T cells, once they migrate to the T cell area. Even though it has long been thought that B cells were not required for T cell priming (23, 24, 25), recent data show that Ag presentation provided by B cells is required for an optimal activation of T cells (26). Recent favorable clinical trials in human autoimmune disease such as RA and multiple sclerosis using the anti-CD20 Ab rituximab further implicate B cells as playing an important role in Ag presentation to T cells. B cells indeed express costimulatory molecules and are thus able to give the two signals required for T cell activation. Moreover, CD40, mainly expressed by B cells, is required for the development of the Th1 response to T. gondii in B6 mice (27). We thus studied the role of Ag presentation by B cells in the activation of T cells observed in our system. We first investigated the requirement of Ag specificity. D7B cells primed with WT parasites enhanced IFN-γ production by OVA-specific T cells at the same extent as D7B cells primed with OVA-secreting parasites, despite the ability of OVA-secreting parasites to induce an OVA-specific T cell response (16). Thus, B cell activation, but not Ag specificity, is required. These data were confirmed by the equal, if not increased, ability of D7 MHCII−/− B cells compared with D7 WT B cells to enhance IFN-γ production by splenic T cells at D7, when transferred into μMT mice. Taken together, these findings eliminate the necessity of Ag specificity in the observed proinflammatory effect of D7B cells. Moreover, the observations of the coculture of B/T cells in the presence of blocking Ab anti-CD154 would suggest that activation of T cells by B cells does not require CD40/CD154 interactions. This activation of B cells toward a proinflammatory profile is unlikely driven by cognate interactions with CD4 T cells, as suggested by the equal, if not higher, proinflammatory capacity of MHCII−/− B cells. Activation of B cells through TLR signaling or cross-presentation to CD8+ T cells are other possible pathways. For instance, engagement of TLR9, which plays a critical role in the development of the Th1 response to T. gondii (28), can drive activation of B cells without help of T cells and thus participate in the activation of pathogenic B cells in autoimmune (29) diseases. In addition, B cells can present Ags to CD8+ T cells via MHCI cross-presentation (3, 4), and possibly get activated in a similar way as in cognate interactions with CD4 T cells. The clear change of the function of B cells that become proinflammatory at D7 led us to screen for possible modifications of B cell biology. We observed that D7B cells were characterized by a dramatic change of their phenotype as follows: whereas most naive B cells are B220high CD23+, B cells at D7 were mainly B220high CD23− (our unpublished observations). Additional experiments of GFP+ B cell transfers and analysis of their phenotype showed that this change in phenotype was most likely due to a decreased CD23 surface expression by B cells, and not to a shift in B cell subsets. Indeed, a recent study showed that IFN-γ induces a down-regulation of CD23 expression by B cells (30). IFN-γ released by T or B cells could explain this dramatic reduction of CD23 expression by B cells. The shedding of CD23 from the plasma membrane is another possibility. The soluble form of CD23 activates in vitro monocytes to produce proinflammatory cytokines (31, 32) and has been associated with inflammatory disorders such as RA (33, 34, 35, 36). TNF-α expression by B cells was also greatly increased at D7, and TNF-α−/− D7B cells were not as efficient as WT D7B cells to increase IFN-γ production by T cells at D7, implicating a possible role for TNF-α in mediating the proinflammatory effect of D7B cells. TNF-α is a major proinflammatory cytokine, via activation of the NF-κB pathway, and can induce IFN-γ expression and is involved in chronic inflammatory diseases such as inflammatory bowel disease or RA (37, 38, 39). In particular, overexpression of the membrane-bound form of TNF-α is sufficient to induce RA in mice (40). 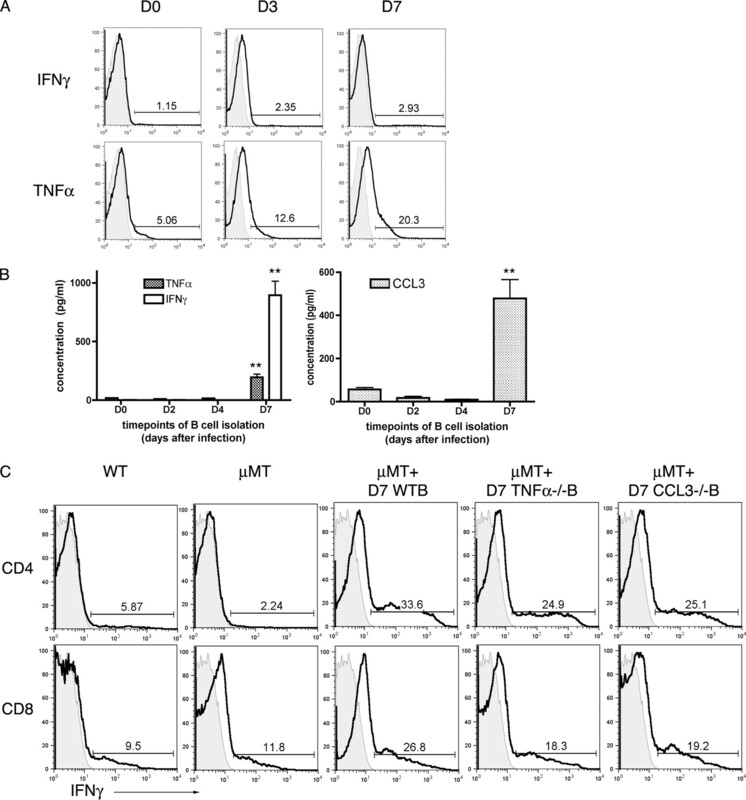 The necessity of contact between B and T cells for the proinflammatory effect of B cells as demonstrated in vitro may indicate that the transmembrane TNF-α is the major source of TNF-α responsible for the enhancement of IFN-γ expression by T cells. In contrast to the IFN-γ+ D7B cells that are represented by a low frequency and nevertheless release large quantities of IFN-γ when cultured 24 h, the frequency of TNF-α+ D7B cells was relatively high compared with the amount of TNF-α found in the culture supernatant. This observation would suggest that the TNF-α measured by intracellular cytokine staining is primarily membrane bound and not secreted. CCL3 is a potent chemoattractant that binds CCR1, CCR3, or CCR5 expressed by a large panel of cell types, including T cells (41). It is involved in autoimmune disorders such as RA (42), inflammatory bowel disease (43, 44), or experimental autoimmune encephalomyelitis (45). We can speculate that CCL3 secreted by D7B cells attracts T cells and is involved in the enhancement of IFN-γ production by T cells. These findings provide a novel insight into an alternative mechanism by which B cells can enhance a proinflammatory T cell response. ↵1 This work was supported by National Institutes of Health Grant AI19613. ↵3 Abbreviations used in this paper: RA, rheumatoid arthritis; MLN, mesenteric lymph node; WT, wild type. Mills, D. M., J. C. Cambier. 2003. B lymphocyte activation during cognate interactions with CD4+ T lymphocytes: molecular dynamics and immunologic consequences. Semin. Immunol. 15: 325-329. Heit, A., K. M. Huster, F. Schmitz, M. Schiemann, D. H. Busch, H. Wagner. 2004. CpG-DNA aided cross-priming by cross-presenting B cells. J. Immunol. 172: 1501-1507. Hon, H., A. Oran, T. Brocker, J. Jacob. 2005. B lymphocytes participate in cross-presentation of antigen following gene gun vaccination. J. Immunol. 174: 5233-5242. Iwasaki, A., R. Medzhitov. 2004. Toll-like receptor control of the adaptive immune responses. Nat. Immunol. 5: 987-995. Harris, D. P., S. Goodrich, A. J. Gerth, S. L. Peng, F. E. Lund. 2005. Regulation of IFN-γ production by B effector 1 cells: essential roles for T-bet and the IFN-γ receptor. J. Immunol. 174: 6781-6790. Harris, D. P., S. Goodrich, K. Mohrs, M. Mohrs, F. E. Lund. 2005. Cutting edge: the development of IL-4-producing B cells (B effector 2 cells) is controlled by IL-4, IL-4 receptor α, and Th2 cells. J. Immunol. 175: 7103-7107. Harris, D. P., L. Haynes, P. C. Sayles, D. K. Duso, S. M. Eaton, N. M. Lepak, L. L. Johnson, S. L. Swain, F. E. Lund. 2000. Reciprocal regulation of polarized cytokine production by effector B and T cells. Nat. Immunol. 1: 475-482. Martin, F., A. C. Chan. 2004. Pathogenic roles of B cells in human autoimmunity; insights from the clinic. Immunity 20: 517-527. Cross, A. H., J. L. Stark, J. Lauber, M. J. Ramsbottom, J. A. Lyons. 2006. Rituximab reduces B cells and T cells in cerebrospinal fluid of multiple sclerosis patients. J. Neuroimmunol. 180: 63-70. Liesenfeld, O.. 2002. Oral infection of C57BL/6 mice with Toxoplasma gondii: a new model of inflammatory bowel disease?. J. Infect. Dis. 185: (Suppl. 1):S96-S101. Liesenfeld, O., J. Kosek, J. S. Remington, Y. Suzuki. 1996. Association of CD4+ T cell-dependent, interferon-γ-mediated necrosis of the small intestine with genetic susceptibility of mice to peroral infection with Toxoplasma gondii. J. Exp. Med. 184: 597-607. Mennechet, F. J., L. H. Kasper, N. Rachinel, W. Li, A. Vandewalle, D. Buzoni-Gatel. 2002. Lamina propria CD4+ T lymphocytes synergize with murine intestinal epithelial cells to enhance proinflammatory response against an intracellular pathogen. J. Immunol. 168: 2988-2996.
Pepper, M., F. Dzierszinski, A. Crawford, C. A. Hunter, D. Roos. 2004. Development of a system to study CD4+-T-cell responses to transgenic ovalbumin-expressing Toxoplasma gondii during toxoplasmosis. Infect. Immun. 72: 7240-7246. Burg, J. L., C. M. Grover, P. Pouletty, J. C. Boothroyd. 1989. Direct and sensitive detection of a pathogenic protozoan, Toxoplasma gondii, by polymerase chain reaction. J. Clin. Microbiol. 27: 1787-1792. Courret, N., S. Darche, P. Sonigo, G. Milon, D. Buzoni-Gatel, I. Tardieux. 2006. CD11c- and CD11b-expressing mouse leukocytes transport single Toxoplasma gondii tachyzoites to the brain. Blood 107: 309-316. Elder, P. K., C. L. French, M. Subramaniam, L. J. Schmidt, M. J. Getz. 1988. Evidence that the functional β-actin gene is single copy in most mice and is associated with 5′ sequences capable of conferring serum- and cycloheximide-dependent regulation. Mol. Cell. Biol. 8: 480-485. Crowley, M. T., C. R. Reilly, D. Lo. 1999. Influence of lymphocytes on the presence and organization of dendritic cell subsets in the spleen. J. Immunol. 163: 4894-4900. Rachinel, N., D. Buzoni-Gatel, C. Dutta, F. J. Mennechet, S. Luangsay, L. A. Minns, M. E. Grigg, S. Tomavo, J. C. Boothroyd, L. H. Kasper. 2004. The induction of acute ileitis by a single microbial antigen of Toxoplasma gondii. J. Immunol. 173: 2725-2735. Epstein, M. M., F. Di Rosa, D. Jankovic, A. Sher, P. Matzinger. 1995. Successful T cell priming in B cell-deficient mice. J. Exp. Med. 182: 915-922. Topham, D. J., R. A. Tripp, A. M. Hamilton-Easton, S. R. Sarawar, P. C. Doherty. 1996. Quantitative analysis of the influenza virus-specific CD4+ T cell memory in the absence of B cells and Ig. J. Immunol. 157: 2947-2952. Itano, A. A., M. K. Jenkins. 2003. Antigen presentation to naive CD4 T cells in the lymph node. Nat. Immunol. 4: 733-739. Crawford, A., M. Macleod, T. Schumacher, L. Corlett, D. Gray. 2006. Primary T cell expansion and differentiation in vivo requires antigen presentation by B cells. J. Immunol. 176: 3498-3506. Li, W., D. Buzoni-Gatel, H. Debbabi, M. S. Hu, F. J. Mennechet, B. G. Durell, R. J. Noelle, L. H. Kasper. 2002. CD40/CD154 ligation is required for the development of acute ileitis following oral infection with an intracellular pathogen in mice. Gastroenterology 122: 762-773. Minns, L. A., L. C. Menard, D. M. Foureau, S. Darche, C. Ronet, D. W. Mielcarz, D. Buzoni-Gatel, L. H. Kasper. 2006. TLR9 is required for the gut-associated lymphoid tissue response following oral infection of Toxoplasma gondii. J. Immunol. 176: 7589-7597. Sukumar, S., D. H. Conrad, A. K. Szakal, J. G. Tew. 2006. Differential T cell-mediated regulation of CD23 (FcεRII) in B cells and follicular dendritic cells. J. Immunol. 176: 4811-4817. Lecoanet-Henchoz, S., J. F. Gauchat, J. P. Aubry, P. Graber, P. Life, N. Paul-Eugene, B. Ferrua, A. L. Corbi, B. Dugas, C. Plater-Zyberk, et al 1995. CD23 regulates monocyte activation through a novel interaction with the adhesion molecules CD11b-CD18 and CD11c-CD18. Immunity 3: 119-125. Lecoanet-Henchoz, S., C. Plater-Zyberk, P. Graber, D. Gretener, J. P. Aubry, D. H. Conrad, J. Y. Bonnefoy. 1997. Mouse CD23 regulates monocyte activation through an interaction with the adhesion molecule CD11b/CD18. Eur. J. Immunol. 27: 2290-2294. Huissoon, A. P., P. Emery, P. A. Bacon, J. Gordon, M. Salmon. 2000. Increased expression of CD23 in rheumatoid synovitis. Scand. J. Rheumatol. 29: 154-159. Kleinau, S., P. Martinsson, S. Gustavsson, B. Heyman. 1999. Importance of CD23 for collagen-induced arthritis: delayed onset and reduced severity in CD23-deficient mice. J. Immunol. 162: 4266-4270. Plater-Zyberk, C., J. Y. Bonnefoy. 1995. Marked amelioration of established collagen-induced arthritis by treatment with antibodies to CD23 in vivo. Nat. Med. 1: 781-785. Ribbens, C., V. Bonnet, M. J. Kaiser, B. Andre, O. Kaye, N. Franchimont, D. de Groote, Y. Beguin, M. G. Malaise. 2000. Increased synovial fluid levels of soluble CD23 are associated with an erosive status in rheumatoid arthritis (RA). Clin. Exp. Immunol. 120: 194-199. Holtmann, M. H., M. Schutz, P. R. Galle, M. F. Neurath. 2002. Functional relevance of soluble TNF-α, transmembrane TNF-α and TNF-signal transduction in gastrointestinal diseases with special reference to inflammatory bowel diseases. Z. Gastroenterol. 40: 587-600. Palladino, M. A., F. R. Bahjat, E. A. Theodorakis, L. L. Moldawer. 2003. Anti-TNF-α therapies: the next generation. Nat. Rev. Drug Discov. 2: 736-746. Plevy, S. E., C. J. Landers, J. Prehn, N. M. Carramanzana, R. L. Deem, D. Shealy, S. R. Targan. 1997. A role for TNF-α and mucosal T helper-1 cytokines in the pathogenesis of Crohn’s disease. J. Immunol. 159: 6276-6282. Alexopoulou, L., M. Pasparakis, G. Kollias. 1997. A murine transmembrane tumor necrosis factor (TNF) transgene induces arthritis by cooperative p55/p75 TNF receptor signaling. Eur. J. Immunol. 27: 2588-2592. Menten, P., A. Wuyts, J. Van Damme. 2002. Macrophage inflammatory protein-1. Cytokine Growth Factor Rev. 13: 455-481. Chintalacharuvu, S. R., J. X. Wang, J. M. Giaconia, C. Venkataraman. 2005. An essential role for CCL3 in the development of collagen antibody-induced arthritis. Immunol. Lett. 100: 202-204. Banks, C., A. Bateman, R. Payne, P. Johnson, N. Sheron. 2003. Chemokine expression in IBD: mucosal chemokine expression is unselectively increased in both ulcerative colitis and Crohn’s disease. J. Pathol. 199: 28-35. Pender, S. L., V. Chance, C. V. Whiting, M. Buckley, M. Edwards, R. Pettipher, T. T. MacDonald. 2005. Systemic administration of the chemokine macrophage inflammatory protein 1α exacerbates inflammatory bowel disease in a mouse model. Gut 54: 1114-1120. Matejuk, A., J. Dwyer, A. Ito, Z. Bruender, A. A. Vandenbark, H. Offner. 2002. Effects of cytokine deficiency on chemokine expression in CNS of mice with EAE. J. Neurosci. Res. 67: 680-688.